There are plenty of occasions when you need extra height on a golf shot. Hitting over a tree, for example, or trying to stop an approach shot on a small portion of green. Play it forward, open the clubface: To maximize height, you must get the most from the club's loft. 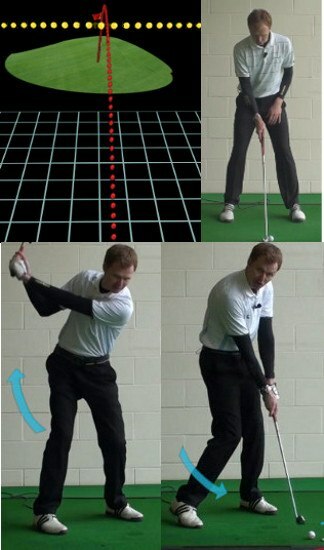 The farther back in your stance (to the right-hander's right) you position the ball, the more you de-loft the club. Therefore, playing the ball closer to your left foot adds loft, as does opening the clubface by aiming it slightly right of target. Remember to align your feet a little left and count on the ball fading just a touch. Take less club and swing harder: A 9-iron has more loft than an 8-iron, and so forth. The harder you swing, the more backspin you create, and backspin sends the ball higher into the air. Knowing these things, it makes sense that taking less club than you normally would for a shot, then swinging with a little extra “oomph,” will deliver the needed result. Just make sure you've got enough club to carry any hazard in your way. Stand closer and finish high: Golfers with upright swings (a la Jack Nicklaus) typically hit the ball higher than do those with flat swings (like Matt Kuchar). You don't need to completely alter your technique to swing on a more vertical plane – just stand an inch or so closer to the ball, and the rest will take care of itself. Also, picture yourself with hands high over head at the finish, then swing to this position. That will ensure an upright arc coming into and through the shot. Playing good golf requires adjusting to a seemingly infinite number of variables in any given round. The time will come when your only hope for par is a towering, soft-landing shot. Follow the tips above and you'll see it's not so tough. Learning to control the height of your golf shots is one of the biggest steps you can take as a golfer. It is one thing to be able to hit the ball on line – that is certainly hard enough – but your game will go to a new level when you learn how to control trajectory as well. Sometimes, it will be necessary to keep the ball down, such as when you are playing into the wind. On other occasions, however, you will need to be able to send the ball high up into the air. It is this second skill that we are going to focus on in the article below. Let's get this first point out of the way right from the start – it is not easy to hit the golf ball high. It is much easier to hit a low shot, as long as you understand the basic technique. Most players can learn how to hit low shots with just a bit of practice, but the same cannot be said for high shots. Developing this skill is going to take some hard work, but it will be worth it in the end. With the ability to hit high shots always tucked away in your bag, you can pull these shots out when you need them most. Having a variety of shots at your disposal is a powerful thing in golf, as you never know what the course is going to throw your way. In this article, we are going to talk about a couple of different types of high shots. For one thing, we are going to discuss hitting the ball high with your full swing. What can you do to cause the ball to fly higher? When would this kind of shot be useful? We'll tackle those questions in the content that follows. Also, we are going to talk about high shots in the short game. Learning how to hit the ball high around the greens is certainly an advanced skill, but that shouldn't stop you from trying to add this type of shot to your game. When you know how to hit your short shots high in the air, you will have a chance to get up and down from nearly any position. For many years, the game of golf was played along the ground. It was thought that the best way to move the ball up toward the hole, and eventually into the cup, was to keep it as close to the ground as possible. Of course, there were very good reasons for this strategy. For one thing, the equipment used in the early days of golf was not well-suited to hitting high shots. Also, the game was developed on the wind-swept Scottish landscape, where hitting the ball up in the air wasn't really an attractive option. Today, the game looks much different than it did in those early days. For one thing, the equipment we use in the modern game is perfectly capable of hitting high shots. In fact, many of the design characteristics that you will find in the clubs on the market today are put in place specifically for the purpose of hitting high shots. Also, the game is now played all around the world, including in places where wind is not much of a problem. Windy links courses still call for low shots, but many of the modern courses around the world are designed in a such a way that hitting the ball high is the only way to go. So, what can you gain when you use a high trajectory to attack your target? Let's take a look at some of the primary benefits of high golf shots. Maximum carry distance. By hitting the ball high in the air, you are going to maximize – or, at least, get close to maximizing – your carry distance. This makes sense, of course, as a lower shot will not be able to stay in the air as long as one which was sent high up into the sky. Maximizing carry distance is great when you are playing on a soft golf course, as a lower shot will not travel as far before landing softly and coming to a stop. This is why long hitters have such an advantage on soft courses. With the ability to launch their drives high in the air, a long hitter can leave a shorter hitter in the dust when course conditions are soft. Depending on where you play the majority of your golf, this may or may not be an important point. For those who always play in dry and firm conditions, carry distance isn't such a big deal. On soft courses in wet climates, however, it is a huge advantage to hit the ball farther in the air. Stop the ball quickly. Ironically, our next point is going to be most important on firm and fast courses. When playing a dry course, your biggest challenge is getting the ball to stop close to your targets. If you hit low shots that take big bounces and have plenty of roll, it'll be tough to accurately hit your spots. By hitting the ball high, you can use backspin to stop the ball rather quickly after it lands. There will still be a bounce or two, but those bounces won't cover much horizontal distance, and the ball should then stop quickly – assuming you put plenty of spin on the shot. The ability to hit high shots on a firm course really becomes valuable when attacking hole locations cut near the edges of the green. Where you might not be able to take an aggressive line with a lower ball flight, you should be able to fire away when you know you can hit it high and stop it quick. Take advantage of a favorable breeze. Usually, when the wind is up, you want to keep the ball down close to the turf. However, if you are hitting a tee shot downwind on a long hole with a wide fairway, there is no reason not to take advantage of that wind. Send the ball high up into the sky and let the breeze do the rest of the work for you. Not only will using this strategy help you send the ball farther down the fairway, but hitting in the downwind direction can actually straighten out your shots as well. You aren't going to find yourself in this position too often, so be sure to take advantage when you get the chance. Get over a hazard. This might be an obvious point, but it deserves a spot on our list nonetheless. Sometimes, the best reason to hit a high shot is simply because you need to get the ball over a hazard on the way toward the target. For example, if you are hitting an approach shot to a green that is guarded by a pond, you'll need to hit the ball high to carry the water and land on the putting surface. If you were to take this kind of shot in low, you might catch the water hazard before you reach the grass. Even something like a deep bunker across the front of the green will be easier to avoid if you have the ability to hit high shots. There is a lot to gain when you add the ability to hit high shots to your golf game. You certainly don't need to hit all of your shots high – and you probably shouldn't – but having the ability to do so is a valuable skill. When the time is right, turn to your high ball flight and give yourself a great chance to put the ball right next to the target. Plenty of speed. Simply put, you need to make a fast swing in order to send the ball high in the air. Hitting high shots takes ample swing speed, so don't hold anything back through the hitting area. Plenty of spin. Backspin is what is going to take the ball high in the air, since the spin will provide the ball with lift as it flies toward the target. If you are going to achieve impressive backspin rates, you'll need to contact the ball cleanly, and you'll need to have a good lie. If you don't have a good lie, you won't impart enough spin on the ball, and the shot is likely to fly low. Plenty of loft. Of course, you are also going to need loft in order to hit the ball high. It is going to be much easier to hit high shots with clubs like short irons and wedges than it will with long irons. Sure, it's possible to hit high shots with your long irons, but you will need exceptionally high swing speeds and you'll need to make great contact, as well. Now that you understand what you need in order to hit the ball high enough to accomplish your goals, it is time to think about your swing technique. There are some key ways in which you can alter your technique when trying to hit a high shot to give yourself a better chance of success. The list below highlights the three keys to use on the driving range while you work on your high shots. Set your hands slightly behind the ball. When taking your stance over the ball, set your hands slightly behind the position of the ball – in other words, your hands should be just to the right of the ball, as you are looking down from address. By setting up in this position, you are going to expose more of the loft of the club to the ball at impact. The shot that comes off your club should leave higher than it would have otherwise, and the ball will sail higher in the air. Play the ball slightly forward in your stance. Again, this is a point which is going to help you launch the ball a bit higher. While it is a good idea to move the ball just a bit forward in your stance, you don't want to go too far with this point. By moving the ball too far up in your stance, you'll have trouble reaching a good impact position without falling off balance. Make a full turn. In a hurry to hit the ball high, you might forget to finish your backswing properly. Of course, you are going to need a full backswing if you want to produce the kind of speed necessary to hit a high shot. So, it is important that you take the time necessary to finish your backswing correctly. Turn fully back away from the ball, and only start the club down toward impact when you are sure that you've made a great turn. Hitting the ball high is going to take practice. You can't expect to just use this with good results out on the course during the middle of your next round. During an upcoming practice session, take some time to hit a few shots higher than the rest of your standard shots. If you hit even just a few high shots during each practice session, you should get better and better at this skill as time goes by. Final thoughts to wrap up this discussion on high shots, we want to touch on the topic of shot selection. We have alluded to this part of the game throughout this article, but we need to highlight it here. There is a difference between being able to hit a high shot and having that high shot be the right choice for the situation at hand. Most of the time, you want to keep the ball down whenever possible. Low shots tend to be easier to hit than high shots, and they are more repeatable from swing to swing. You don't want to find yourself in a position where you are constantly leaning on high golf shots to get you out of trouble. The best way to think about your high shots is as an option you can use, when necessary. Your default option should be to play the ball lower, but you'll know in the back of your head that you can turn to a high shot if the lower path isn't going to work. As you gain experience, you will be more and more confident in the shot selection process, both from the fairway and from around the greens. We hope the advice in this article will help you play better high golf shots in the near future. Remember, you can't afford to overlook the importance of practice in this equation. Without plenty of practice, your high shots are always going to fall short of expectations. Work on this part of your game regularly and look forward to pulling off some beautiful high shots in future rounds. Good luck!